The Former Head of State, Rtd. Brig. 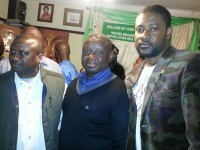 Julius Maada Bio has told Sierra Leoneans in London that what he did as Head of State in 1996 to ensure a smooth democratic transition from military rule to multi-party democracy and his efforts to start the Peace Talks with Foday Sankoh were part of his responsibilities rather doing favours to Sierra Leoneans. In his address, the former Head of State with his usual humility started by expressing appreciation to members of the Sierra Leone Community in U.K who attended the occasion. He told his audience that on many occasions throughout the campaigns in the 2012 elections, many people would always narrate the role he played as Head of State in 1996 to ensure that our country return to democracy and his efforts to reach out to Foday Sankoh. He went on “What I did was my responsibility and not a favour to Sierra Leoneans. If by being in power was against the democratic will of the people and my stay could have put the lives of Sierra Leoneans at risk then all I had to do was to respect the democratic will of the people and did not put the lives of Sierra Leoneans at risk.” The audience applauded whilst a member from amongst the audience shouted “God will bless you, Maada Bio”. Rtd. Brig. Julius Maada Bio also emphasised that during his term as Head of State, there were many friends and individuals who benefitted from the system who would tell him that he should not handover power. But he said as a Leader, sometimes you have to make a decision between two competing interests: on the one hand, you may have the interests of your family, friends and close individuals whilst on the other hand there is the interest of the majority of people. “At that tender age and with all the pressure from friends and close individuals, I put the interest of the majority of the people above my friends, family, individuals and my personal interests” he added. Furthermore, he said the reason why people write or say so many things about him is because in his three months as Head of State, he left a track record of peaceful democratic transition and initiating a contact with RUF’s Foday Sankoh. The former Head of state also said that for the few people, who always write to smear him, they have had 17 years to prove whatever allegations or claims but they have failed to do so. No doubt, that message was pleasing to the ears of many of the APC members who led the rapturous applause with all smiles. There were also many responses from the audience as speaker after speaker showered praises on Rtd. Brig Julius Maada Bio for his courage and strong leadership whilst serving as Head of State in one of the most defining moments during our history. According to Micky Fofanah, Chairman of Union of Sierra Leoneans, UK/Ireland, a registered charity organisation which seeks to promote the welfare of Sierra Leoneans at home and UK/Ireland, he recalled in 2002 that the Rtd. Brig. Julius Maada Bio was part of a team of well-meaning Sierra Leoneans who assisted in finding an office space for a charity organisation called “International Association of Sierra Leoneans Abroad” (INASLA). So for him, he has always known the Rtd. Brig. Julius Maada Bio as someone who seeks the welfare of Sierra Leoneans and the country. He went on “I am not a politician. As an organisation we are only trying to do the best to help our country and people. But I believe, someone like the Rtd. Brig. Julius Maada Bio who has demonstrated exceptional leadership, we must always be grateful to him”. For her part, the Vice Chairlady of Union of Sierra Leoneans, UK/Ireland, Madam Marie Kabia said that she was very pleased to see the Rtd. Brig. Julius Maada Bio in person for the first time as many of the times she has only heard about his name and the positive things he did for the country as Head of State. She said Sierra Leone needs a leader who loves his country and care for the people and that the Rtd. Brig. Julius Maada Bio has demonstrated that as Head of State. In his contribution, Alpha Sankoh, Auditor of Union of Sierra Leoneans, UK/Ireland and an APC member said Sierra Leon is facing lot of challenges and no doubt about it people are not happy because of the present suffering. He said about the Rtd. Brig. Julius Maada Bio, “It takes any Patriot who loves his country to decide what is best for the country. Therefore, whoever puts the interest of the country above his personal interest that is the person we should look up to and Maada Bio falls in that category.” He ended his short remarks by advising the Rtd. Brig. Julius Maada Bio that what he needs to do now is to carry on with the slogan: One Country, One People. Understandably, his contributions for the night received a very loud applause. Other speakers at the occasion also included executive members from other UK based Sierra Leonean Charity Organisations among whom was Ishmeal Bash Kamara who spoke on behalf of a Charity Organisation called “MUANA”. 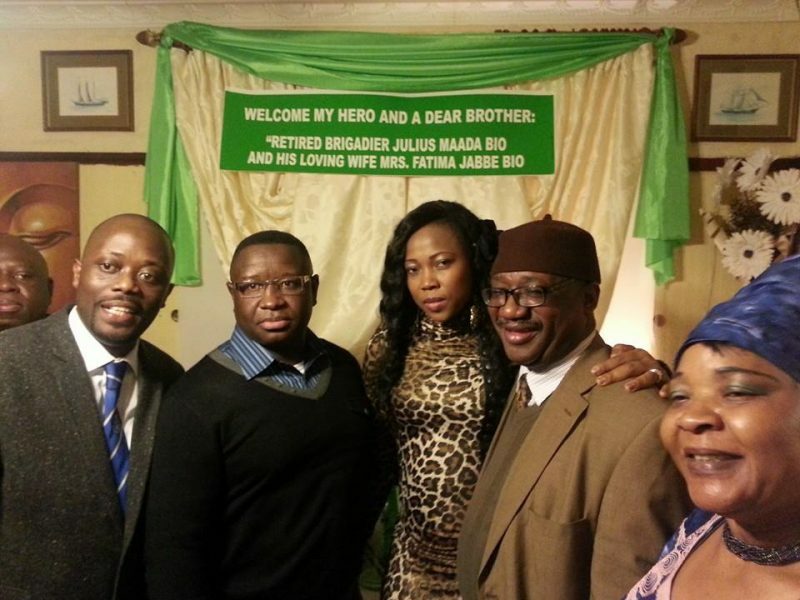 Fatima Jabbe Maada Bio, wife of the Rtd. Brig. Julius Maada Bio, also took the opportunity during the night to speak very passionately about her husband whom she referred to as a very loving, caring and compassionate husband. On behalf of the Bio Family, Princess Bio, younger sister of Rtd. Brig. Julius Maada Bio thanked all the guests for honouring his brother in appreciation of the things he did as Head of State which always make them proud as a family. She said whilst the occasion was not a political campaign gathering but she believed the occasion has given people a chance to ask questions, narrate their stories and most importantly listened to her brother. It could also be recalled that according to Senate Congressional Record, (Pages S3958 – S3959) dated April 23rd 1996, Senator James Jeffords submitted for himself and three other senators, (Mrs Kassebaum, Mr Simon and Mr Feingold) a Senate Concurrent Resolution 53 Relative to the Republic of Sierra Leone. In her contribution to the Senate Concurrent Resolution 53, Senator Nancy Landon Kassebaum said about Rtd. Brig. Julius Maada Bio “Finally, I want to commend the former military ruler of the country, Julius Maada Bio, for respecting the results of the elections. Until the last moment many questioned whether the military would actually hand over power. Of course, many military rulers – including some in West Africa – have ignored elections. But Brigadier Bio demonstrated Statesmanlike Leadership in guiding his country to Democracy and I believe history will look upon him kindly".